While we’re all reacting to the recent Charleston church shootings, I’d like to share with you a story. I learned it my first week in Australia, and it’s astonishing in both its sadness and subsequent strength, with an ending that goes against what we as Americans think is possible. In 1996, there was a major gun tragedy in Australia. A gunman named Martin Bryant killed 35 people and wounded 23 in Port Arthur, Tasmania. Beginning in the morning, he killed two people his family had a business conflict with, then went to a popular tourist spot and began a rampage where he murdered dozens of random bystanders. Bryant’s speed and indiscriminate carnage is shocking. He used two semi-automatic rifles and it took only 15-30 seconds for him to kill his first 12 people and wound 10. Ninety seconds later, he had killed 8 more. Over the course of the day, he would murder another 15 innocents until a fiery standoff with police brought him into custody. It was one of the most horrific and deadliest killings worldwide perpetrated by a single shooter. The Australian government and public were universally appalled by the massacre, viscerally rejecting it as fundamentally unacceptable. In the aftermath, Prime Minister John Howard began a gun-reform campaign and warned not to “go down the American” path when it came to guns. Public support was with him. Immediately Australia transformed its gun control laws. At the time of the Port Arthur massacre, gun laws varied greatly state-by-state and Tasmania in particular had lax regulations: easy access to guns without a permit, registration not required for most guns, and fully automatic firearms available (they were already banned on the mainland). So there was need for an overarching approach. Under the Australian Constitution the federal government does not have power to enact gun laws, so Prime Minister Howard brought the states together to each adopt a National Firearms Agreement, which banned semi-automatic guns and created tight regulations on gun permitting and ownership. Along with these reforms, the government did a massive buyback where it purchased and destroyed guns in circulation that were now illegal. And, just six months after the massacre, a whole country handed in their most dangerous guns. Of course not everyone was in favor of the new regulations and buyback program, but there was enough general public agreement and strong federal leadership to make it happen. Nowadays if you want to shoot guns in Australia you still can, you just have to go through a process, and about 5% of Australians do. There are shooting clubs, people hunt, and use guns on farms. But they’re all registered, had to show the purpose of the gun, and are permitted a gun that is appropriate for the need. Since 1996 reforms, there hasn’t been a violence backlash and gun crimes are rare. As an American, it bewildered and impressed me that a society could deal with the issue of gun control so swiftly and resolutely. (How would that be politically possible?!) The Australian perspective now takes strong gun control as common sense and uncontroversial, and I applaud our leaders who seek to learn from other countries’ solutions. I know Australia is not America and I don’t claim to have a 10-point plan to solve America’s gun issues, but shouldn’t our society and government take some sort of action to better protect its citizens from themselves? Because what is more baffling: that Australia did something serious and widespread about gun control or that America isn’t? Domestic Nepal flight to Pokhara: FAIL! After five days in Nepal in three different cities we still hadn’t seen the mountains due to fog and haze. With shaky weather forecasts ahead, we decided express transport was in order to ensure sun and mountain-viewing in Pokhara, a hotspot for outdoor activities near the Annapurna range in western-central Nepal. We made this snap decision over breakfast, so after finishing our banana lassis and veggie momos we raced to the travel agent and bought plane tickets for that day 2pm. Henry in particular looked at the tiny puddle jumper flight as a potential mountain sight-seeing opportunity. This is going to be fun! Our taxi dropped us off and identified a ramshackle building ahead as the domestic terminal. As we approached, we wondered what airport security might be like and when Henry made a joke about monkeys getting through I giggled. Then he pointed just to my right, “no, seriously, there’s a monkey right there.” Sure enough, there were monkeys all around us, climbing the trees and sketchy power lines, even in the airport arrival lounge. We viewed the terminal building skeptically. It was a literal construction zone. Is this really the right place? Without the help of signage, we picked our way through the rubble and found the departure area. Security was lax and check in a mess: “the weather is bad, flights from earlier were cancelled and are backed up, we *think* your flight is delayed so just wait for a while.” A woman next to me said relative chaos was the normal state of things and happens every time she flies through this airport. Pigeons roosted and fought above our heads. In the jam-packed boarding lounge, we watched as a comical spreadsheet projection displayed flight statuses: “bad weather, all flights delayed, Pokhara airport closed, next update @15:00”. They began updating when we could expect the next update. We overheard that planes can’t land at the Pokhara airport after dark because there are no lights… great. A group of older British gentlemen began scrambling a helicopter. Henry got us snacks and beer. By 4pm our flight and all others to Pokhara were officially canceled due to storms. We collected our bags and refunds, actually in good spirits as it was an interesting experience rife with opportunity for snarky remarks. But lesson learned: flying domestically in Nepal sounds quick (30 minute flight!) but is not always a safer bet than ground travel, especially when you don’t make any forward progress. Then again, let’s give this another try to fly again tomorrow, this time escaping the bad weather of Nepal completely and heading internationally to Delhi! * All photos courtesy of Henry Whitehead. In Australia, the job market is strong and the wages are high, making it an attractive place to work temporarily while experiencing a new culture. The “Work and Holiday” or “Working Holiday” visa (depending on what country you’re from) is an easy and common way for young people to earn money and travel. There are lots of working holiday travelers in Australia, but not many of them are American. It isn’t a strong part of American culture to travel long-term as working age adults; we travel perhaps as part of a university foreign exchange program, but infrequently take a gap year let alone extended time off from work once you start a career. Before two years ago, I didn’t even know it was possible to live and work in another country virtually unrestricted for a year! But programs like Australia’s Work and Holiday visa are excellent options for young people to explore living in a new culture while making money but without the hurdle of employer-sponsored longterm visas. I encourage you–especially if you’re American–to consider giving it a try and to spread the word within the states. The thought of attempting to find work in another country can be daunting. I heard stories from other travelers about the high cost of living (Australia is the 6th most expensive country in the world, after all) and was nervous about how it would be to a job. Fortunately, now four months in, I have found employment fairly easy to get and am greatly enjoying living and working in Perth, Western Australia. Now I feel I shouldn’t have been so nervous! So how should *you* get started? A Work and Holiday visa allows young people ages 18-30 to temporarily work any job in Australia as long as no job with a single employer is longer than 6 months. Americans are eligible for a Work and Holiday visa (subclass 462); Europeans, Canadians, and other countries can receive a Working Holiday visa (subclass 417) that is essentially the same but allows for a second year if you complete rural work. It costs about $400USD for the visa and is very easy to apply, using the links above. After putting in my application online, I received my visa by email within 36 hours. Once you get your visa, you have one year to enter Australia and then one year after you arrive to live and work in the country. So you’re headed to Australia. But it’s a big place… where specifically? I found choosing where to go one of the most difficult decisions. Melbourne is very popular, as is Sydney, and offer the most vibrant cultural scene in Australia and (I assume) a healthy traveller population. I however chose Perth because I had Australian friends living there, so had a solid start to a support network and a place to stay. This choice was key to my experience, and my friends were invaluable with giving emotional support, sorting out logistics, introducing me to new people, explaining cultural differences, and just being all around super-incredibly-awesome. With their help, I integrated into living more like an Australian, rather than a tourist. The following steps are to be done in country. It may feel scary to just make a leap without having a job waiting for you or for all the pieces in place, but you can do it! I recommend travelers actually having that $5,000 in your bank account that the Australian government requires for Working Holiday visa folks… there are initial costs and it takes a little time to get settled (I got my first job approximately 4 weeks in). Having some cushion money to live off of makes the process far less stressful. You will make it back. This is your Australian tax ID number and while you can work without one, if you don’t have one you will pay monstrously more tax. Get one. It takes 2 minutes to apply for online. I did this one day one, and it came in the mail in about one week. You can start working without a TFN and then submit it to your employer within 30 days to receive the tax benefits. Easy to do, just walk into banks and ask around. Most Australian banks offer a free basic account. I have a NAB Classic Bank Account that has no fees plus all the usual bells and whistles of a debit account. Alongside, I have free savings account that earns 3.5% interest (unheard of is the US but standard in Australia) and I can move money between the two accounts instantly. Included in my welcome packet were letters to give employers on how to pay me through my new account. I dug the optimism. This perhaps isn’t necessary, but sure does help if people are trying to contact you and offer a job! Mobile plans are cheap and easy if your phone accepts SIM cards. Most carriers offer $30/month prepaid plans with varying benefits. Telstra is known as having the best overall coverage but is the most expensive. I have a monthly prepaid plan with Optus, one of the other major carriers, and for $30/mo get 1G data, unlimited domestic texting, 350 minutes domestic talk, and a $5 extras credit that I can use for 250 minutes of call time to America. Score. Step 5: Start looking for work! I highly recommend initially using a temp agency. Even though the visa is *supposed* to be for any job, realistically Work and Holiday/Working Holiday candidates are hired as lower level labour: wait staff, receptionists, fruit pickers, au pairs, manual labour, et cetera. Many job postings on Seek (the local job board of choice, but I haven’t found it particularly useful) specify the position is for Australians only, even for temp work. For my entrance to the job market, I determined office work was probably my best bet because a) I’m currently living in a city, b) it’s probably my highest earning potential, and c) I wanted day shifts that matched most of my friends’ schedules. I was referred by a friend to a recruiting agent who could link me into temporary office work. Recruiting agencies are popular in Australia and I found they made my job search heaps less painful. I submitted a resume, went in for an interview, and took tests to measure my typing speed/accuracy and proficiency with MS Office. I was given pointers on how to tailor my resume to Australian employers, made edits, and out it went to potential employers. One week after my initial interview I accepted a full time temporary receptionist job, paying $25AUD/hr. Not my dream job, but a decent start to my shiny new Australian bank account! After my establishing some professional street cred, I’ve had luck easily securing new temp jobs through the same agency. Using a temp agency was a great choice for me, and I’d highly recommend other travelers check them out. I’ve also picked up a few independent one-off jobs: being a Christmas fairy at a local mall (obtained through friend of a friend of a friend who heard I was looking for work) and working weekend staff at a music festival (I emailed the festival past their deadline but asked for paid work anyway and got an offer right away). I’ve also volunteered for cultural events that get me in to see shows for free. Businesses really do seem to need workers here, so it’s work simply contacting a place you like and seeing if they’re hiring. Once you have the building blocks sorted, it’s fairly stress-free to continue picking up jobs and sustaining your year (or two) in Australia. So come on in, the water’s fine… take the plunge! En route to Australia, I flew through four countries in 22 hours, landing in Singapore for a three-day stopover. I arrived just after midnight, took the convenient hotel shuttle from the airport (leaving the airport every 15 minutes, approx $7USD) to my hostel doorstep on the fringe of Little India. I crept into the female dorm in the dark, scaled up to my top bunk, and crashed. The next day, I poked my head out to explore nearby Little India. There are many ethnic groups represented in Singapore, and many have enclaves in various neighborhoods. When I got hungry, I followed locals to the grungy but cheap and tasty Tekka Center food court and found myself a plate of veg curry for $3SGD. 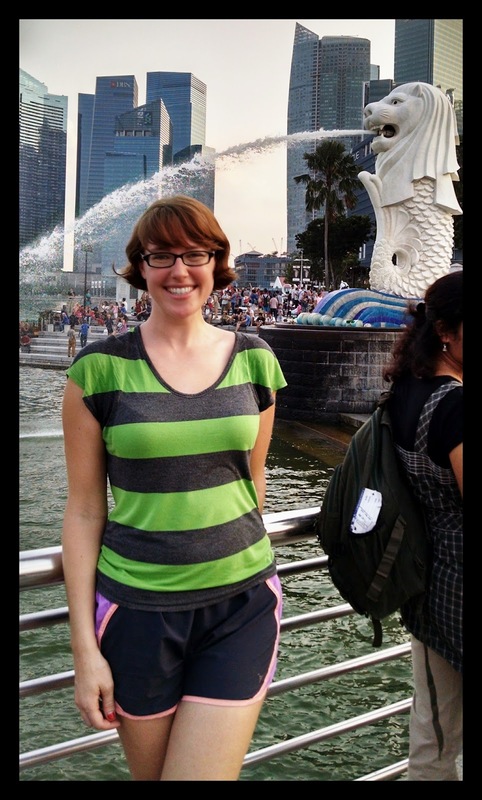 One of the highlights of visiting S’pore was catching up with a old high school friend I hadn’t seen since graduation. She and her husband have been living there for four years. 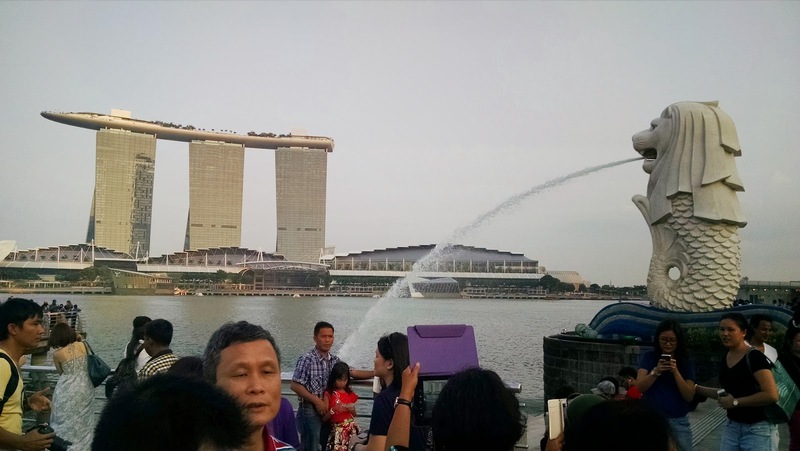 She and I took a sunset walk along the water, chatting about ex-pat life, dipping into hotels when we needed a blast of AC, and introducing me to the iconic Singapore Merlion. I squealed when I saw it from afar! The skyscrapers and luxurious hotels and shops–the Louis Vuitton store along the water, sparkling in the sun–in the prime marina district were night and day from the gritty Little India neighborhood of my hostel. Marina Bay Sands Hotel, across from Merlion Park. For dinner, she took me to her favourite hawker markets, Lau Pa Sat. Recently remodeled, it is one of many food stall markets that provide a way for street food to exist but be regulated. This corralled system appears to work, offering the benefits of cheap and tasty food with stronger supervision than can be achieved with chaotic independent street food. 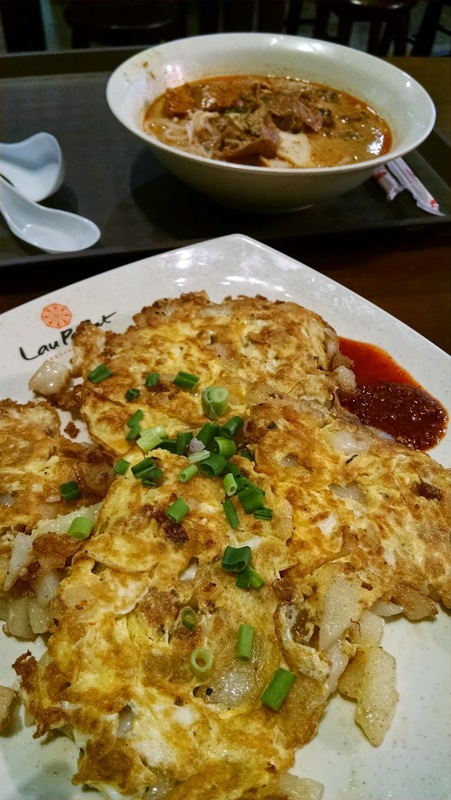 (But it does lose some of the personality…) We dined on a few local foods she said I must try: laksa (a curry noodle soup, like a spicier ramen) and fried white carrot cake (not actually carrot, instead it is turnip cake scrambled in with fried egg topped with onion and chili). Both were tasty, but more significant about the evening was enjoying my friend’s company. Fried white carrot cake and laksa dinner. I zipped home on the seamless subway (loved it), hunkering down and sleeping at odd hours for the next day. I confess I didn’t get to know Singapore as well as I should have. My general impressions were that it feels of but also not of SE Asia. Prices were on par with the US, contrary to other cheaper places in SE Asia I have traveled. I was surprised when walking around Little India and Kampong Glam (the Arab quarter, nearby) how quiet the streets were. Not nearly as much life out on the streets as Thailand, Vietnam, or Cambodia. It didn’t feel as vibrant. Things were very orderly, almost sterile. During my stay, I fell mostly victim to jet lag, travel adjustment, the easy-flowing AC in my hostel, and an early bout of homesickness. Also, a budding addiction to my new luxury item for this trip: a Kindle paperwhite! I am in love with it, and am so happy I finally took the plunge into e-books. Welcome to everyone via CNN Money! I’m so excited to share that a revised version of my “how to pay for longterm travel” article has been published on CNN Money. Welcome to anyone new who has found me through that article! I started writing this blog in 2013 when I traveled to Central America for six months and have more travel forthcoming: I depart on an American west road trip in three days and am planning on heading to Australia for a year on a work and holiday visa in September. So check out my past writings and stay tuned for more adventures soon! Oh, it’s happening, and it feels pretty sweet to see the fundraising buzz phrases go up. Seattle Center is transforming as load-in week began today. T minus three days until Folklife! I mentioned recently the fact that I’m working again and thought I’d share a few more details. 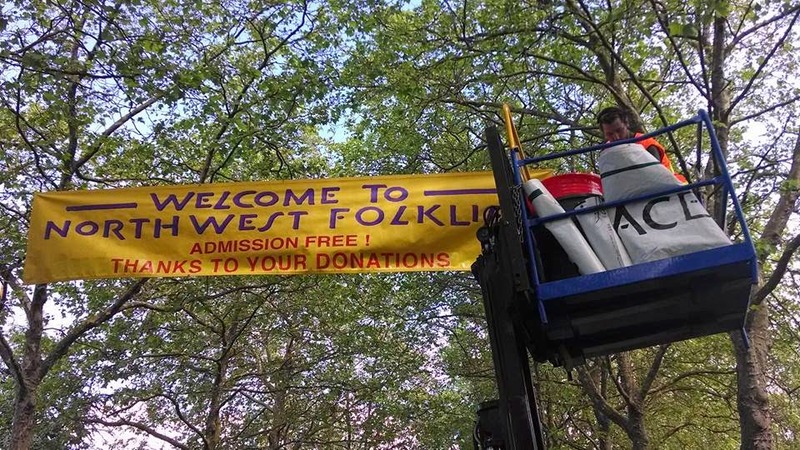 I picked up a gig in my professional wheelhouse: managing summer fundraising efforts for the Northwest Folklife Festival, a Pacific Northwest institution and the largest free, community-powered arts and culture festival in the US. I’ve been working there since March and with the festival launching this Friday I am pretty stoked to set all my on-site fundraising plans into action. We have a good goal of money to raise in four days, but a great team and community of supporters so I am feeling optimistic. A forecast for good weather never hurts either. Bring it on!